Approximately 12 feet tall and about 12 feet wide, Monster Jam trucks are custom-designed machines that sit atop 66-inch-tall tires and weigh a minimum of 10,000 pounds. Built for short, high-powered bursts of speed, Monster Jam trucks generate 1,500 to 2,000 horsepower and are capable of speeds of up to 100 miles per hour. 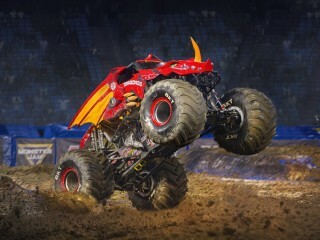 Monster Jam trucks can fly up to 125 to 130 feet in distance and up to 35 feet in the air.